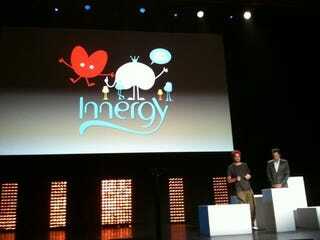 Intended to be a stress-reducing exercise game, Innergy, by Ubisoft, strives to teach you "cardiac coherence" through breathing in time with a pulse pattern on the screen. The game includes a new "Energy Sensor" that will be used to measure your breathing and other vital signals. In the breathing exercise, demonstrated at Ubisoft's E3 2010 news conference, inhaling and exhaling moved a pulse within a waveform pattern, the goal being to synchronize it with the innermost band. Ubisoft's Tommy Francois demonstrated Innergy touting all sorts of healthful claims made by cardiac coherence - immune system improvements, higher confidence, better sleep and better respiratory health. But, yeah, it still looks like a game about breathing. It should have one hell of a set of achievements.